My name is Vicente and I am a 43 year-old guy from Spain. Just before last summer my doctor told me I had to lose weight, again. At that time I weighed about 94 kg (207 lbs). I am 175 cm (5’9″) tall. My non-alcoholic fatty liver disease (NAFLD) had returned. It had improved by losing weight the previous time. But after slimming, once again I regained the lost weight and the fatty liver came back. My iron was out of limits (the ferritin, to be precise). I was taking omeprazole for my GERD. The doctor gave me a paper with a summary table of the calories from different foods. The message I got was that I should control the amount of calories I was eating. It’s a nice doctor, but he has no idea about nutrition, obviously. Anyway, I started to eat less, again. I also increased the amount of exercise I was doing, spending at least half an hour every day on the exercise bike. Instinctively I eliminated bread and pasta from my diet and I started eating very little, about 1200 calories/day. I was often hungry, but I have willpower. I used fatsecret.es to control what I was eating. It is a free page where you write down what you eat and it tells you how many total calories, carbohydrates, protein and fat you are consuming. Now I think it was a mistake to eat so little, but I was desperate to lose weight and did not know what else to do. I lost a few kilos but after about three months I reached a plateu. I had stalled and I was eating only 1200 calories/day! So I thought that as soon as I ate a normal amount of food, around 1700-2000 calories, I would recover all the lost weight (no doubt I would have). I was scared and I started reading articles on the internet about the rebound effect, looking for a way to avoid it. I found nothing useful. I’m not sure how, but I ended up reading (and watching videos) about low-carbohydrate diets; Atkins diet, Gary Taubes, Peter Attia, etc. I decided then to follow a diet low in carbohydrates. Supposedly it wasn’t necessary to count calories, but I did not trust much that idea and I kept counting them and keeping them in the 1300-1700 range. That was about day 100 since I had begun to lose weight and I had already lost 10 kg (22 lbs). Then I did the induction phase of the Atkins diet, based on what I had learned on the internet (I did not buy any book). During those two weeks I reduced my carb intake to a minimum. I kept controlling what I ate and my weight responded, as you can see in the graph above. My weight did not go down too fast (between half a kilo and a kilo per week, I think) and I occasionally reached plateaus, but they disappeared after a few days. I weighed every day and wrote down my weight on a spreadsheet and fatsecret.es. Although my first goal was 76 kg (167 lbs) from the initial 94 (207), when I reached 76 kg I changed my mind and wanted to go to 72 kg (159 lbs). Upon reaching 72 kg (159 lbs), I changed my mind again and I set 70 kg (154 lbs) as the new goal. I reached 69 kg (152 lbs), but in a few days I returned to 70 kg. 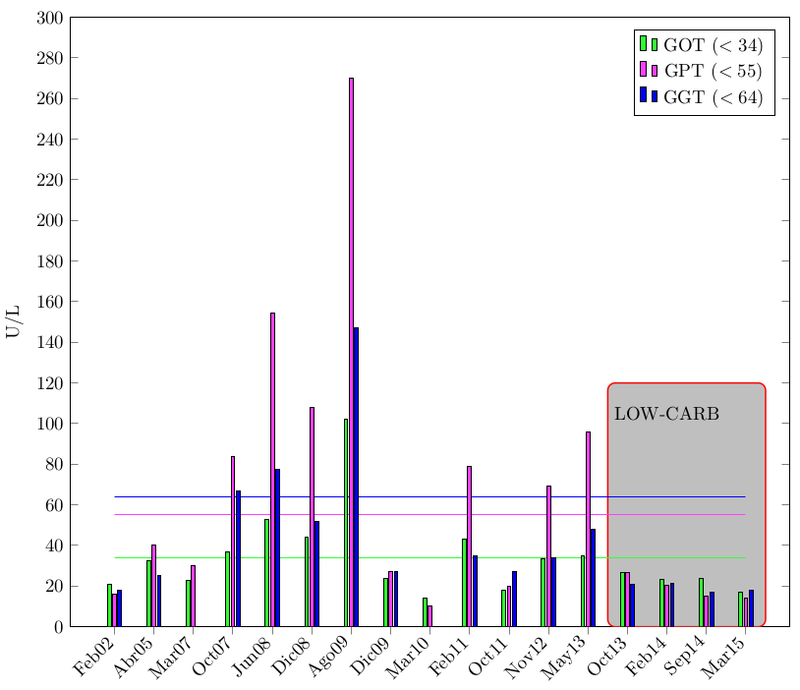 Since then I have never stopped eating low-carb, counting calories the first weeks but I stopped counting. I don’t exercise as much as before. I stay in the range of 70-71 kg (154-156 lbs), I do not starve and I’m better than ever (in all senses). My current carbohydrate intake is limited to a daily intake of probiotics (kefir) and salad vegetables, and a piece of pepper, broccoli, brussels sprouts, etc.. here and there. I barely eat fruit and I avoid anything that contains gluten. Of course no pasta, bread or potatoes. My transaminases are perfect (my fatty liver is gone) and stopped taking medication for my GERD. After dropping the medication for the reflux I started sleeping on an inclined bed, but I also stopped doing that because I no longer have GERD symptoms. It is amazing because I do (or did) have a hiatal hernia. My ferritin levels are still high, that has not changed. My last blood test gives a triglycerides/HDL ratio of 0.7. My lipid profile in general is fantastic. You are free to use all the info above (name and photo included). I followed your suggestion and I created a blog (novuelvoaengordar.com) to share my experience with lchf. Congratulations on your health and weight improvements, Vincente! My blood analysis can be found here . Daily measurement is the best path to developing empirical insight. Nice work. Thanks Gillian and Murray. I really appreciate your encouragement. I keep exercising (I play tennis on a weekly basis) but I don't use my exercise bike any more (as I did while losing weight). I agree with you Murray. 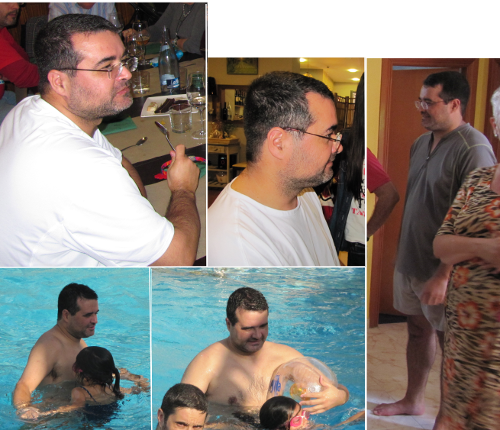 For me daily measurement and control (through fatsecret.es) were key to achieve my goal. Congratulations, Vicente! Do you have any ideas about the continued high ferritin level? My doctor thought it colud be hemochromatosis, but there are no other cases in my family. I have the suspicion that it is related to my past insulin resistance (read this for example, or google this "iron insulin" without the quotes). So, I think I had only one problem: metabolic syndrome. Being fat, NAFLD, GERD and also elevated iron were consequences of the one same problem. That is my bet. I have donated blood several times in the last months (since my last blood results on February 2014) trying to reduce the ferritin and iron levels. But I haven't done a blood test since then, so I don't know where I am now. This is my biggest concern for my future blood tests. That's interesting. I asked because three years ago, when I started eating a LCHF diet I had also been found to have high ferritin levels. Like your doctor, mine wondered about hematomachrosis and suggested the possibility that I might consider giving blood. Unfortunately for me, our health insurance changed that year and it no longer allowed us to see a doctor who was not just your basic western medicine practitioner and the only advice I can get from these people is conventional, which means they think of drugs first and know nothing about nutrition. So basically, I am on my own here. All I know is that since I started eating this way I not only lost weight (and have kept it off) but I feel better and what blood work I have had done looks good, but I always try to find out more about ferritin issues. Hemochromatosis is nothing to fool around with, but it is not the only cause of elevated ferritin. Also like you, I had metabolic syndrome, and that was the real wakeup call for me. However, within 30 days of dropping wheat (and that was so spectacular that I soon dropped all other grains too) I had reversed it, with bloodwork verifying the reversal. For me, the whole experience was incredible - I had been given a second chance at life, but now as a result I am also very, very skeptical when it comes to the advice of conventional western medicine that does not have to do with trauma or infection; I do trust it when it comes to that sort of thing. Keep it up; it sounds like you're doing great! Felicidades a Vicente, el amigo de la madre patria. Debe haber sido dificil con las tentaciones del pan, potajes y vino. Ahora parece un artista de cine. Not really, tony. I suppose it is hard if you give up a lot of foods you like and you see no results. Bread? zero temptation. I am not a film star, but I am really happy with my health and body. Vicente, congratulations on achieving your goal. Fantastic result judging by your photos. I noticed you stated you were taking probiotics (Kefir). Are you making your own milk kefir or is it water kefir? Have you noticed good results? I'm asking as I started making milk kefir myself in the hope of improving my gut flora. It is still too early for me to notice improvements, but I feel sure that my gut health is improving. I make my own milk kefir. I bought a little (20g) using internet and I love it. I'm sorry but I can't tell what health benefits I get from it. I feel perfect, but I can't say it is because of the kefir. Vicente, huge congratulations and thank you for the moral support! Also thank you to wolfstriked, I'm looking at the youtube thumbnails now, just from those you can see a huge change in keto warrior. I agree, just watching the thumbnails one can see an amazing change in ketowarrior. Great job man! I saw the additional pictures you linked, you've made a great transformation! Vicente -- I wholeheartedly agree, I LOVE data! I weigh myself every day and record it. I haven't set it up into a graph like you did though, but I think that would be pretty awesome to see! I haven't been able to figure out how to do that though.. Also, glad to see that you are exercising as well! If you haven't yet, you may want to look into doing some bodyweight strength training! Push ups, pull ups, squats, etc. It's fun to challenge yourself and make yourself "better" by being able to do more this time than you could last time! I love strength training, and do it in the gym, but think that bodyweight strength training can be just as good! Hope you give it a shot! What I find interesting is when "they" want to induce fatty liver disease in a goose, "they" force feed it corn. This is how we get frois grois. However, when a human is diagnosed with fatty liver disease "they" don't know the cause . blood donations worked spectacularly or something else has, because my ferritin and iron levels are now in the normal range. My last lab results are posted here. The rest of markers are ok, but for urea and uric acid, that are too high (for the first time ever). HI! same problem here, i had 6 months with LCHF and I did lost 32 pounds. But my ferritin its going to the sky, HDL, triglycerides, etc its normal but I am getting some kind of fatty liver diagnosis, is that normal with LCHF diet? My transaminases are perfect now. Here (Spanish language) I wrote down a few ideas about the causes of fatty liver. Congratulations Vincente, your story is one I can share with a friend, to help her believe it possible to get better with her fatty liver condition. Thank you. Congratulations for losing weight and really appreciate sharing your experience. I can understand how hard to lose weight and keep controlling your diet plan for long period of time. I have just been informed by a Scottish Hospital that I have NAFLD with Scarring. The initial inflammation was picked up when I was providing blood tests for another issue, acid re-flux. I'm a young, 29 Year Old, 6ft 2in tall and generally fit, no visible signs off excess fat or being classed as overweight. I weigh in at 84.5kg (mainly muscle) and if you were to see me in person who wouldn't think non the wiser. I don't drink often and of course I know the reason behind this life changing disease - high sugary food! I have always had a sweet tooth and generally had a packet of crisps a few times a day, especially in the evening when sitting in front of the TV watching a film of documentary. No more I looked into the foods I was eating one of the major ingredients was corn/fructose syrup which would end up being stored in the liver and glycogen generally. With very little exercise and not using these levels of stored Glycogen levels in my liver I have been polluting my liver to the point that NAFLD is a result. I have alcohol now and then, beer or wine, now I have also been completely put off that. Ignorance is not bliss. I personally feel their is not enough public education on NAFLD here in the UK. I have ben advised that with a high protein diet with complex carbs and moderate exercise that the NAFLD and Scarring can be reversed. Well, when it comes to moderate exercise I do not plan to be moderate, I plan to undertake an all out war on this! I used to run 1500 metres in just over six and a half minutes and now, questionable of course. Going to the gym 5 days a week, 2 hours a day... It's time to get back into that routine. Since hearing this news I have felt sick to my stomach and can't even look at sugar foods at all now. I have a partner and 3 children and run 3 successful companies which are a few years old. I'm now in a position that you read and see so much information on the web that you are unsure on whats the best diet to eliminate the bodies need to sugar as it's main source of energy. My aim is to directly target the fat and glycogen levels (liver) and internal abdomen to rapidly reduce those levels to the levels they should be. My question is: Do any of you have good sources that I can follow to make an effective diet to accomplish this while I work out? thanks for this input, and congrads on losing weight and getting better health. You are amazing! My question to you is was your liver enlarged at any point? 1. How were you diagnosed with fatty liver ?. Was it only through blood test or you got any other scanning done ? 2. Your triglycerides were always as low as 69, then how did you develop fatty liver ? 3. How did you know your fatty liver was gone ?. Was it only blood enzyme tests or some other ultrasound or scanning ? 4. Does fatty liver cause any pain or ache ? 1. I was diagnosed via a CT Scan, with contrast. I believe it can also be picked up via ultrasound. 2. ??? I also have low triglycerides. 3. ??? Guessing I'll have to get another CT Scan or ultrasound in the near future to recheck.?. are not finding out they have it until they have cirrhosis/accompanying symptoms of cirrhosis. VICENTE--Thank you making your journey public! Very inspiring! Good luck to everyone in their journey to great health! Thank you for sharing your experience. I have a non alchoolic fatty liver too. and i'm in the same range of weight you were ( 90 kg ) . When you were above 90 kg (and fatty liver) ,,, di you use to have nausea, vertige (spinning room) and/or weakness ? Hi, my name is Anand, I am from India.. I was diagonesed with Fatty liver Grade 2(Hepatomegaly) 3 months back and I went for review yesterday and my fatty liver is gone (from ultrasound test) and my LFTs are back to perfect levels. I lost close to 18 kgs in 3 months. Congratulations, that is excellent news! Hi, Khairullah here from Pakistan. I've been recently diagnosed with grade 2 fatty liver via ultrasound. I also have high ldl and cholesterol level. I'm seriously worried and upset. How did you do that? You can read more about the keto diet here.